Here is our final installment in the "How To Upload Video" series. 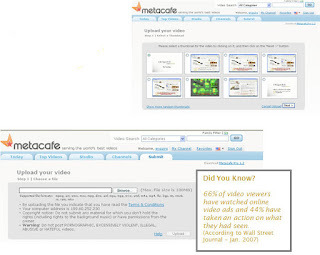 According to comScore Media Metrix, MetaCafe attracts more than 25 million unique viewers each month. Since 2003 Metacafe has been one of the top independent online video sites that is not a video sharing site but more of a entertainment site that focuses on video.